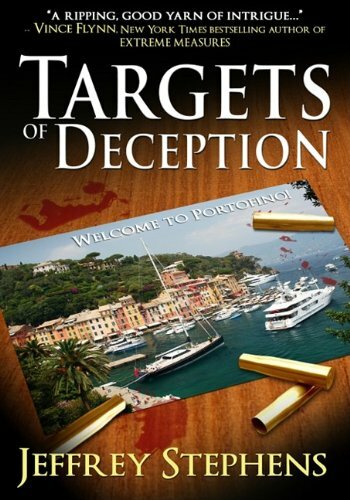 Order ‘Targets of Deception’ by Jeffrey Stephens, available from Amazon.com by clicking on the book cover above! Oh, sorry. I was just seeing myself in the words of lawyer turned novelist Jeffrey Stephens. I inadvertently injected myself into the opening sentence of Stephens’ first published book, Targets of Deception, a spy thriller I finished reading this past weekend and recommend without reservation—or threat of gunshot wound—to my listeners. It is a crackling wild ride with former CIA agent Jordan Sandor—wait; did I say former?—on a case he never planned to be a part of. Or did he? Stephens does a great job of maintaining suspense and mystery around Sandor and his cast of characters as the action transitions from upstate New York to Manhattan, Ft. Lauderdale, Paris and Portofino. If you like this kind of read, take a chance on Deception. Jeffrey Stephens Website • Facebook • Order Targets of Deception from Amazon.com .